Well, my friends, after the first two days of Pre-K, I can finally say that I feel the school year (and my career) has begun! Was it completely chaotic at times? YES. Did I almost lose my voice after the first morning? Yes. Did we have a few tears? Yes (but way fewer than I mentally prepared myself for). Did I have to run after a wandering student several times? Yes. Did I tie shoes, zip zippers, and pull sweaters over heads? Yes. About 100 times. And we are going to start working on independence with these tasks ASAP – haha. Did I absolutely love it? Yes! Having my mornings filled with Pre-K now makes my day go a lot faster! The time really flies when you spend your time with 15 three and four year olds. And boy, do they keep you on your toes! Never a dull moment. I would say that the first two days were a major success! We are working on learning basic routines and procedures at school, and I think this next full week coming up will help solidify these expectations. I even got all of my students sitting in small groups doing table work on the SECOND DAY!!! Sure, it may have only lasted a few minutes, but I call that a victory! I think this picture perfectly sums up Pre-K. It looks chaotic and messy. But all of the students are engaged and learning in their own way. That is what I think our entire education system should strive towards. As I looked back through pictures of the two morning we spent together, my heart soared. I was overwhelmed with pride and love for these amazing little people I get to call my students. It truly is amazing that I am getting paid to spend my day with these lovely, blossoming little learners and be a part of their lives. I promise I won’t take it for granted. I created an OT (Occupational Therapy) kit for an assignment in one of my Education classes. This kit is geared towards Pre-Kindergarten to Grade 1 and is focused on developing pre-printing skills, such as pencil grip and hand strength (as well as some hand-eye coordination activities). The materials within each activity are every day objects that can easily be found around the house. All of the activities are meant to be fun and challenging, so students will actually enjoy practicing these skills. If I were to implement this kit in my classroom, I would have students choose an activity to work on for 5-10 minutes before a printing/writing class in order to warm up their hands. These activities could also be turned into centres in a Pre-K or Kindergarten classroom, too. This station consists of two different activities. 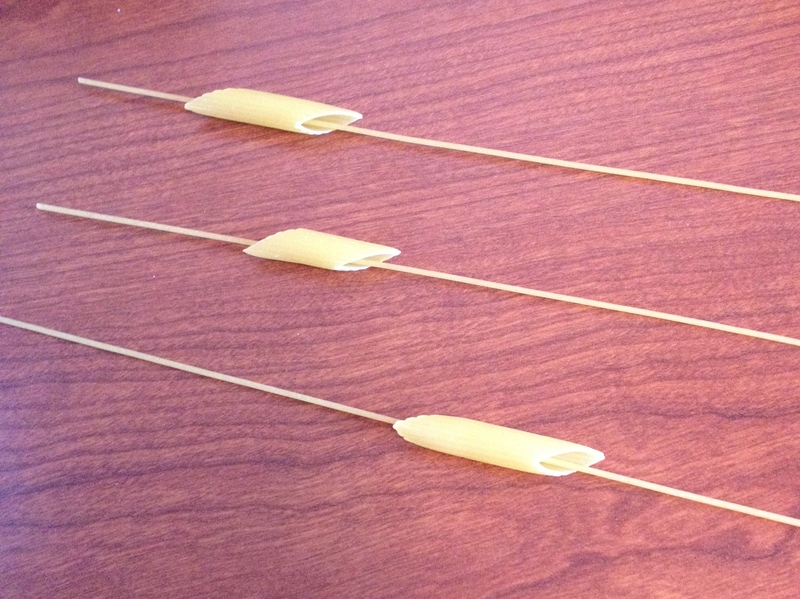 For the first activity, students hold a piece of dry spaghetti in between their thumb and index finger and attempt to pick up a dry penne noodle off of the table. 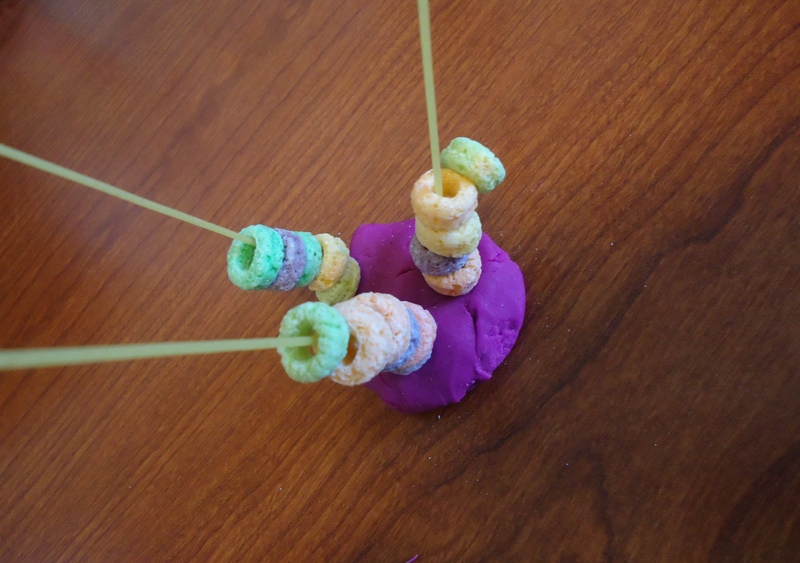 In the second activity, students stick spaghetti noodles into a lump of Play-Doh on the table and use their thumb and index fingers to pick up Froot Loops (or Cheerios, beads, etc.) 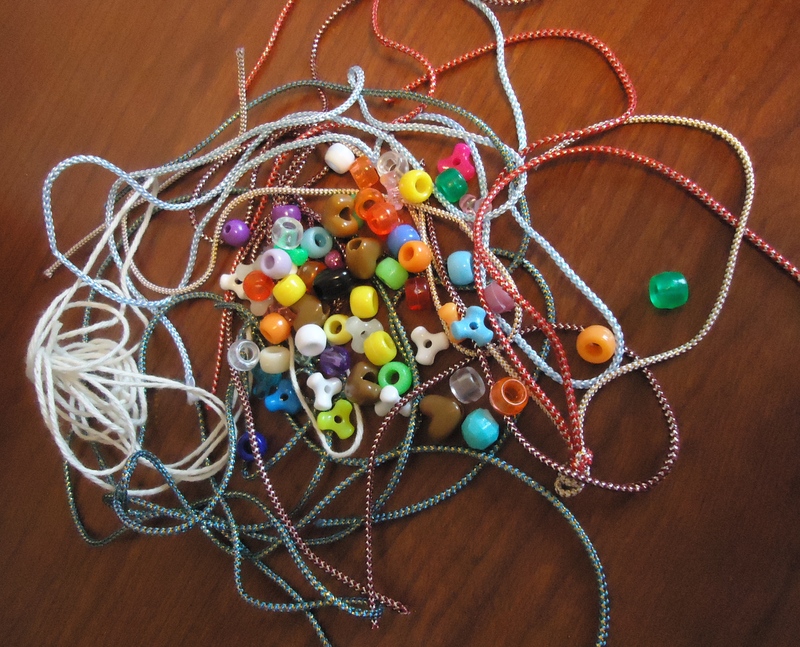 and thread them onto the spaghetti. 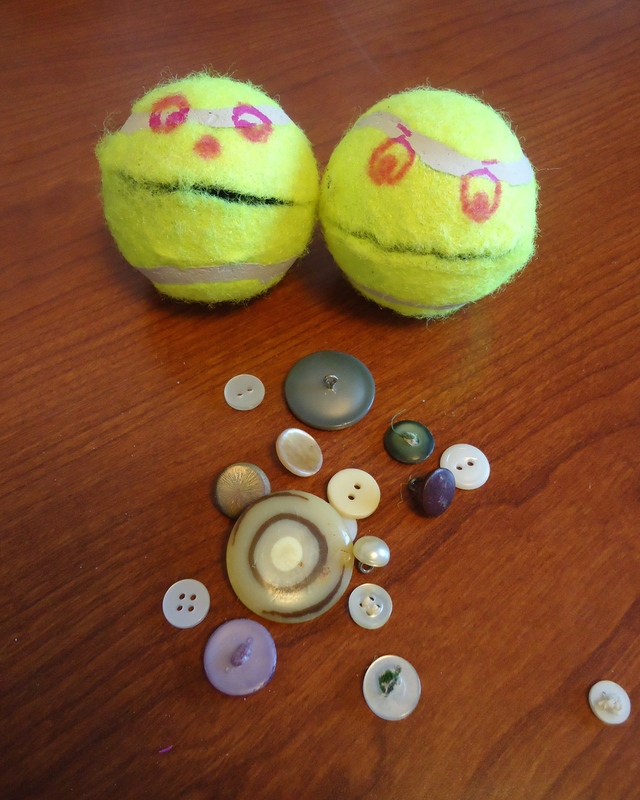 Making Mr. or Mrs. Ball is really easy – just cut a small slit into a tennis ball (the bigger the slit, the easier it is to open Mr./Mrs. Ball’s mouth, so you can have a few with differing sizes to make the activity more challenging as students progress). Students have to use their thumb and index finger to squeeze Mr. or Mrs. Ball so their mouth will open. Then students hold the mouth open and use their other hand to ‘feed’ the ball some buttons, round chips, etc. When Mr. or Mrs. Ball is full, just hold their mouth open and shake out the buttons to start all over. Students use their turkey baster to blow the items off of the edge of the table (note: make sure you use your thumb and index finger to pinch the end of the turkey baster). This activity is a lot harder than it looks! 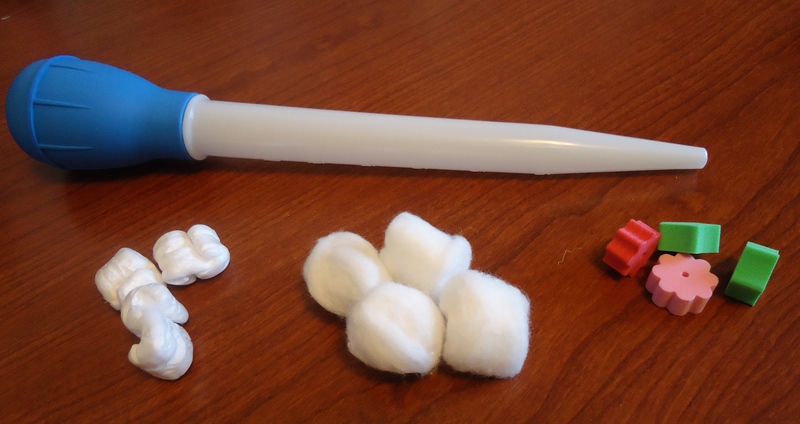 Students may need to hold the small end of the turkey baster with their other hand to ‘aim.’ Materials of different sizes (ex. packing peanuts, cotton balls, small foam beads, etc.) can be used to increase difficulty. 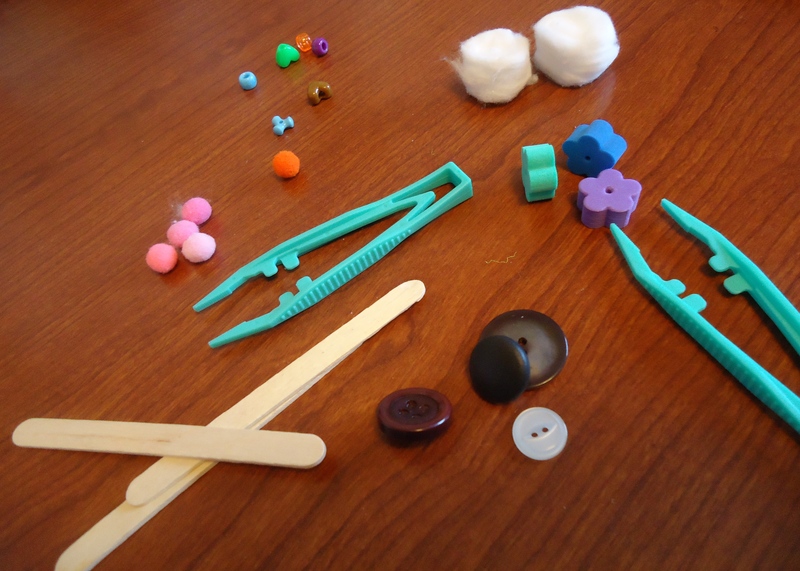 Students use their thumb and index finger to pick up various items (pom poms, cotton balls, beads, popsicle sticks, buttons) with the tweezers. This activity uses triple the hand strength/finger grip! First, place the fish on the floor and have students stand when they use the fishing rod. 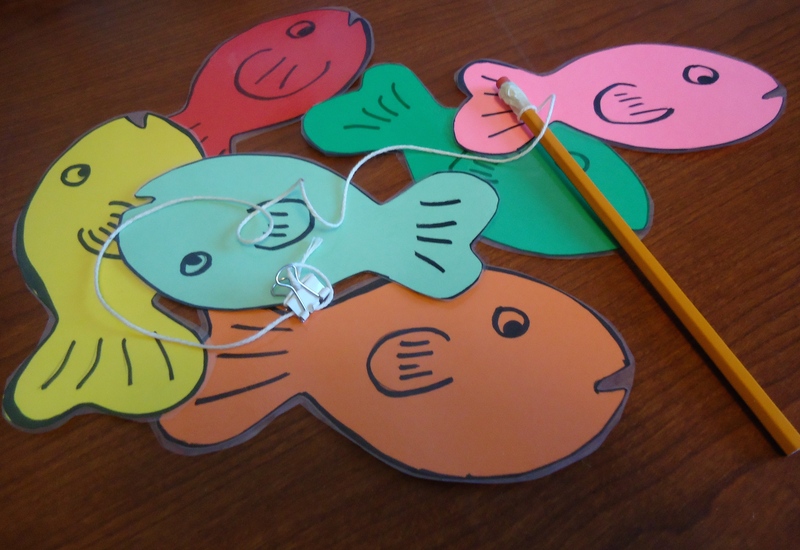 Students must hold the rod in between their index finger and thumb and move the fishing rod so that the binder clip on the end touches one of the fish (this will be a test of hand-eye coordination as well). Once they touch a fish, students bend down and use their pencil-grasp fingers to open the binder clip and clip it to their fish. Finally, students use their index fingers and thumbs (on each end of the pencil) to turn the rod around and around in order to ‘reel in’ their fish (as the string gets shorter and shorter from being wrapped around the pencil). Students will love to be a hero and put out the fire on this burning building! Make sure to laminate the colouring page (or put it in a page protector) so that it can be used again and again. First, students colour in the flames on the picture with washable marker. Then, they dip their sponge into the small cup of water and use it to ‘put out the fire’ by washing off the marker. 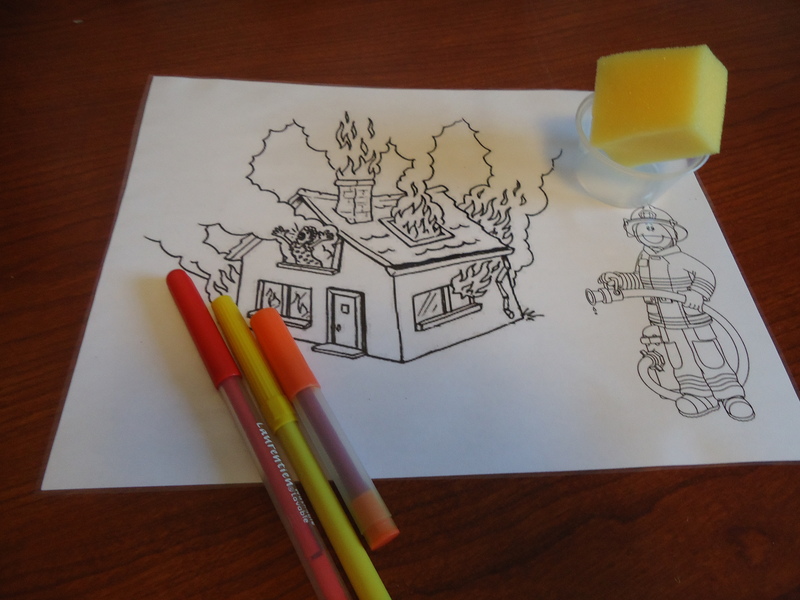 This activity would go great with a Social Studies unit learning about community helpers or a Health unit on Fire Safety! This is another activity that can be surprisingly tough (especially with very bendy straws). Simply cut out some shapes from felt or foam and add holes in the middle. 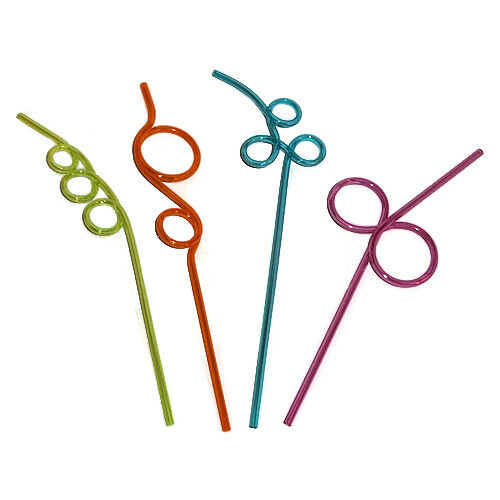 Students thread the shapes onto the straw and attempt to get them off of the other side of the straw by maneuvering the straw and shapes with their index fingers and thumbs. 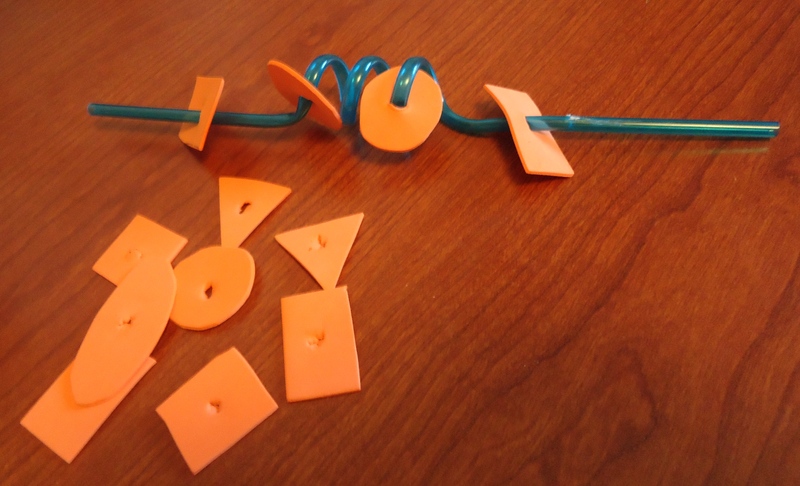 Note: Do not use crazy straws that make a complete loop (shown below), as the foam shapes will not be able to pass through this obstacle. 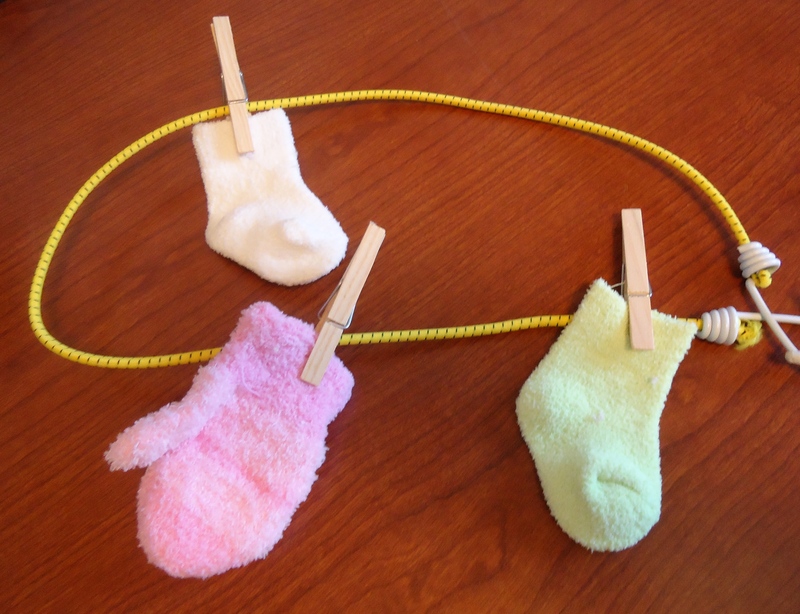 Students simply hang up baby or doll clothes onto a bungee cord or string. Ensure that students are using their thumb and index finger to pinch the clothespins open. math: how many people can you dress with the clothes that are on the line? A Canadian classic! Popsicle sticks as hockey sticks (use your index finger and thumb! 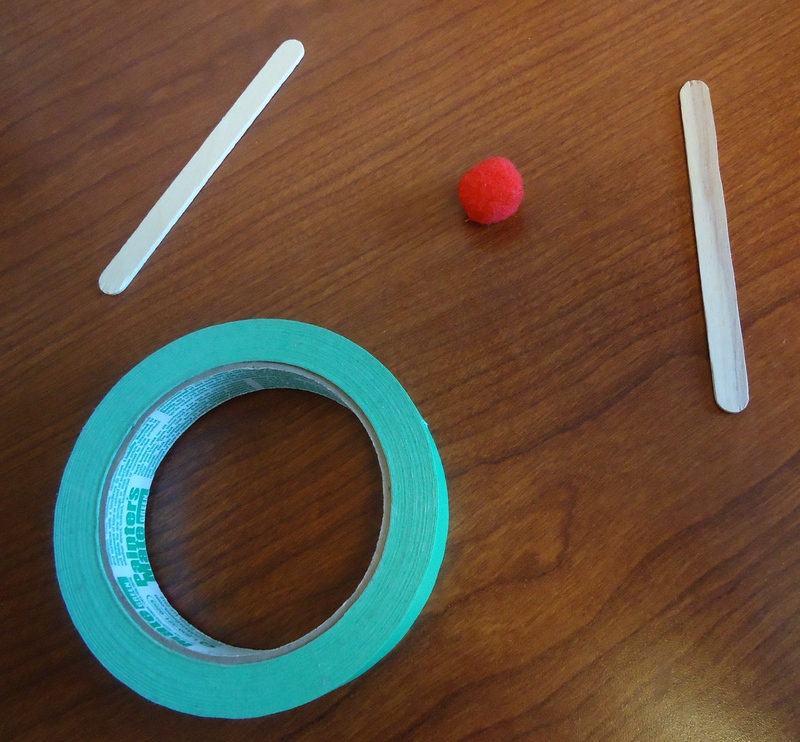 ), pom pom as a puck, and masking tape to make lines/goals. Lay all the pennies out in a line on the table (this works best if all of the pennies are the same way – all with heads showing, for example). Have the students flip the pennies over, one by one, using their index finger and thumb. 2 students form an ‘O’ shape with their index finger and thumb (like the gesture for A-OK!) and hold the rubber band within the ‘O’ they made with their fingers. Students rest their elbows on the table, wrists bent, and slowly move their arms (from the elbow) apart. Try to make the other person’s ‘O’ break. 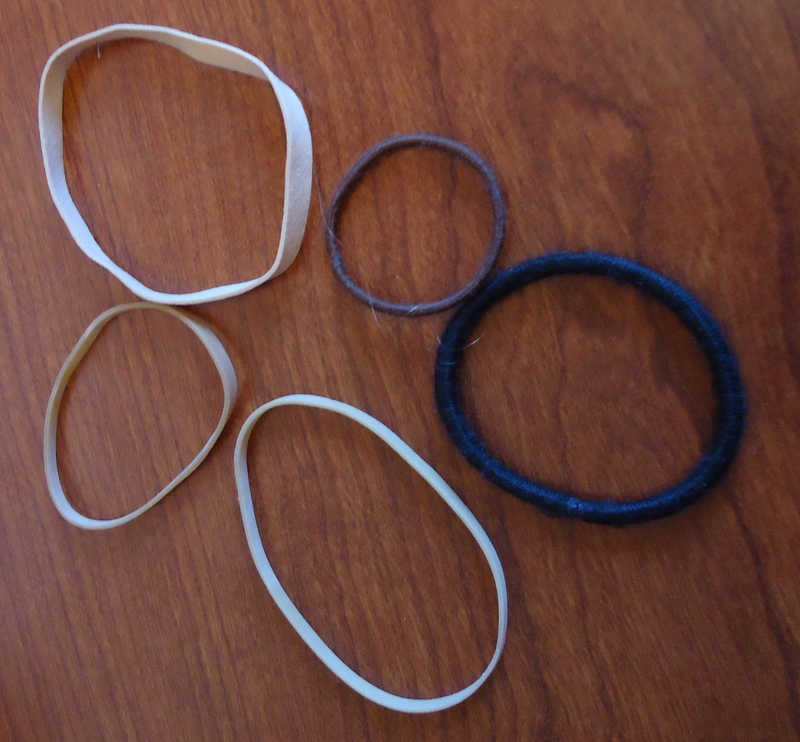 Note: try to have thick rubber bands or bands covered in fabric so that they won’t snap and hurt the students. Emphasize that students use caution – we aren’t trying to hurt each other, just make our fingers stronger! Hand-eye coordination, hand strength, and fine motor skills are rolled into one. Students can take home whatever they make in this station, which is a bonus! 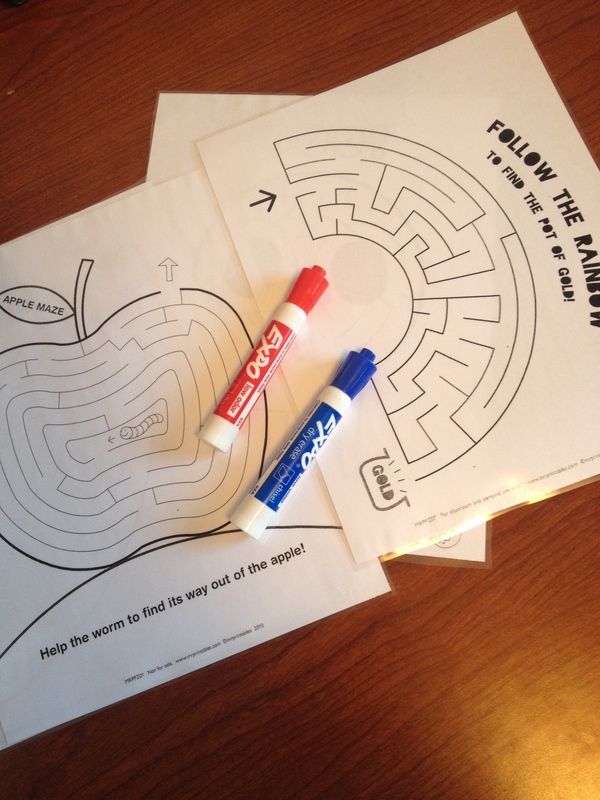 Laminating or putting mazes in a page protector means they can be reused many times. 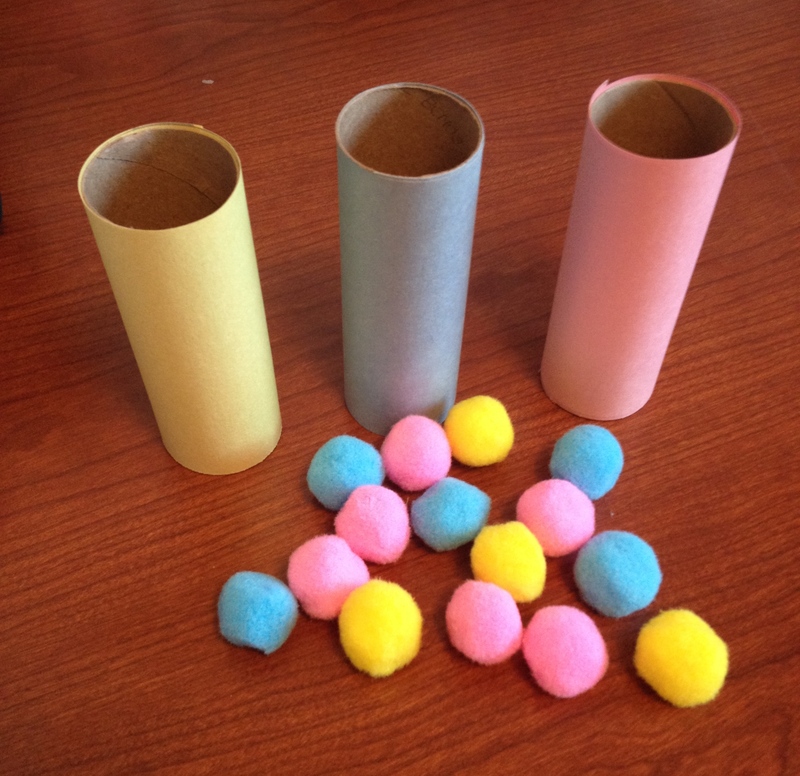 Students use their thumb and index fingers to pick up the pom poms and put them in the corresponding colour-coded tube. This is also a great way for students to learn their colours. math: I had five blue pom poms at the start and I have one left in my hand. How many pom poms are hiding in the tube? quick pick up: how fast can I sort all of the pom poms? Decorate your paper plate rings any way you want. You can make a base for the paper towel tube post or have one student hold the post while the other partner throws the rings. 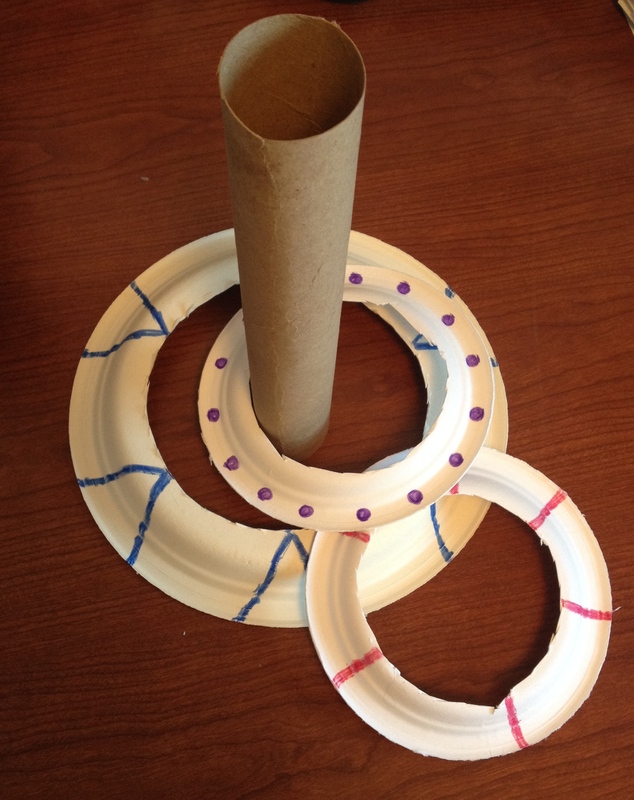 If students make their own paper plate rings, cutting the holes in the plates is a great hand-eye coordination and hand strengthening exercise. Hope you enjoyed my OT kit! What OT activities do you incorporate into your classroom? I did my ECS 100 Field Experience in a Pre-Kindergarten classroom, and the teacher had so many great ideas that I would love to steal!1) Pictures of the students as attendance. When the children come in, they find the picture of themself and stick it to a large board with velcro. At this age, some of them have a hard time distinguishing which picture is theirs, so this is a beneficial activity. The teacher says that as the year progresses, children have to match their picture to their name. 2) Names on felt squares. 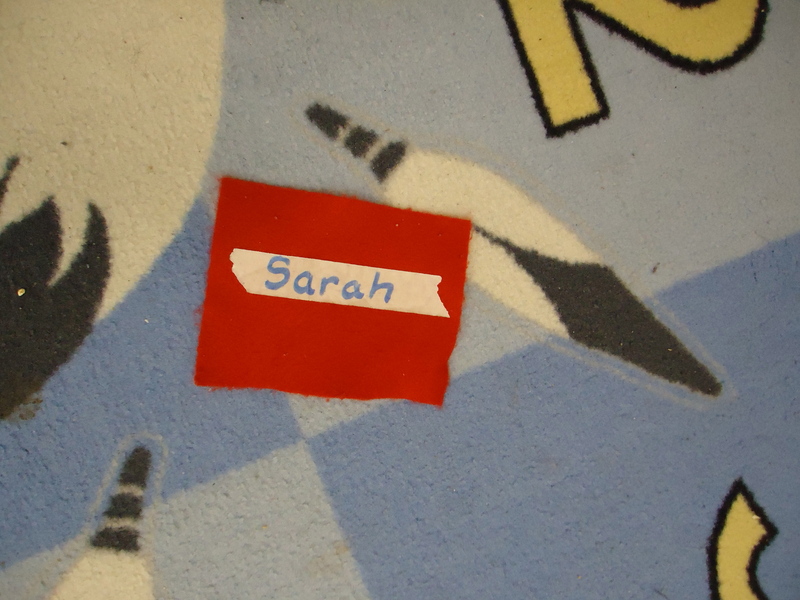 The teacher cut out differently colored felt squares and placed each child’s name on a square with tape. In the morning, they have to find their name square on the rug and sit down on it. 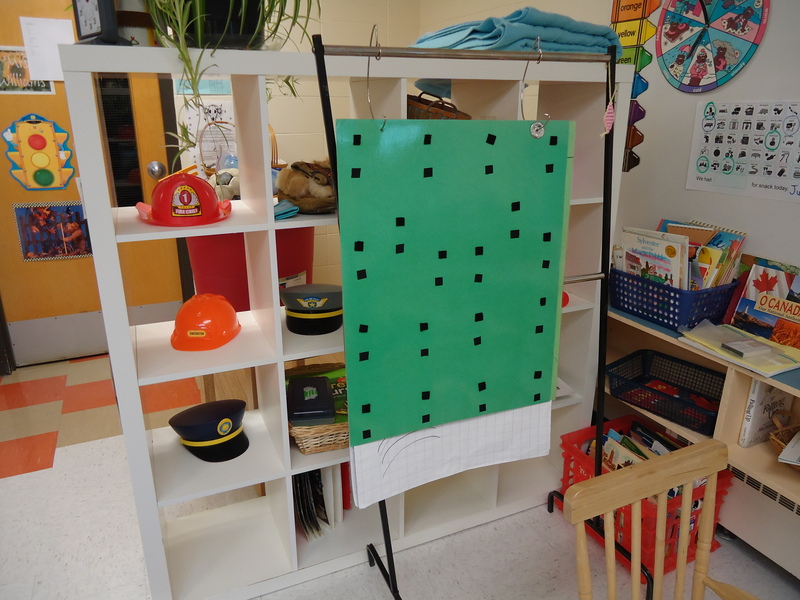 Again, this helps them recognize which name belongs to them (and allows a teacher to decide where the students will sit – talkers/wigglers at the front, chatters not beside each other, etc.). It has actual band-aids in it! So cute. Also, the teacher mentioned that the kids love these books because they are the stars. A blank line where a picture goes and the words “‘s favorite candy is…” and underneath a wrapper of their favorite candy.